As you can all see, we’ve been going a little craft crazy here on My Baking Addiction! There are so many great ideas out there that I want to try and it’s always fun to share another Halloween idea with you. 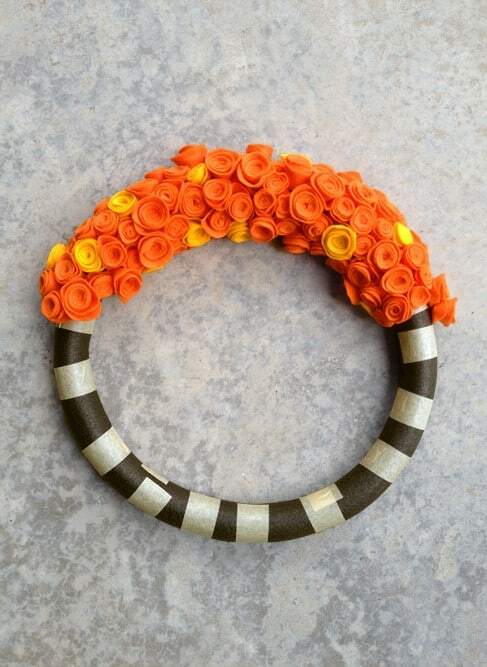 Holiday wreaths are everywhere, and there are so many cool ones to choose from. Jamie and I really liked the wreaths that use handmade felt rosettes, so I turned this Valentine’s Day wreath idea from Handmade by Stacy Vaughn into one that can be used for the Fall holiday season. This idea is really versatile and could be used for any time of the year by switching up the colors. I used orange and gold felt so the wreath could be used all Autumn long, and I switched from black ribbon to brown to take it from Halloween to Thanksgiving. Cut the felt into squares (3×3-5×5 inches). They don’t all need to be the same size. 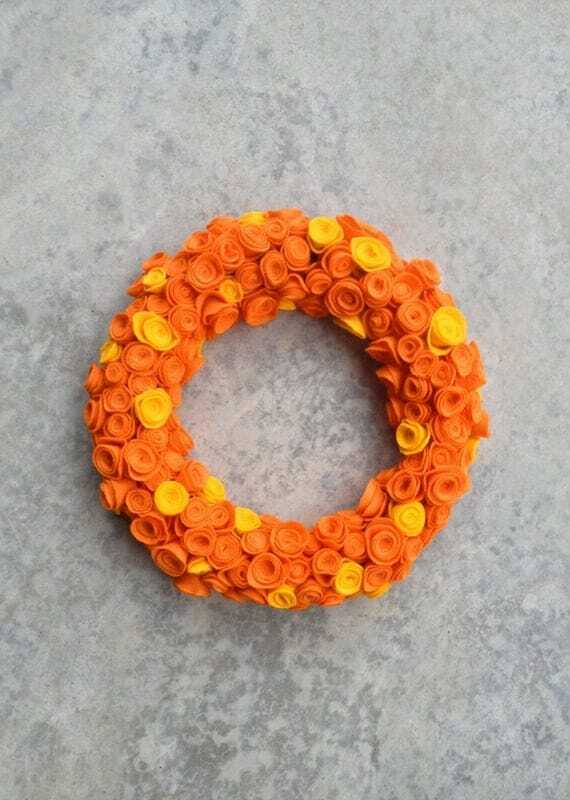 In fact, different sizes help give the wreath depth. After dry attaching your ribbon, hang on door (or dog), and admire your hard work! I couldn’t resist introducing you to my helper Olive, she is very sweet and let me use her as a model. – This craft takes a LOT of patience and a LOT of glue. You might want to skip the craft glue and grab your hot glue gun and a big tube of super glue. – Feel free to use any color of felt and ribbon that strikes your fancy and don’t be afraid to use multiple colors! *We hope you enjoy this Halloween craft as much as we do. If you decide to create this wreath or any of the craft projects that we shared with you, please feel free to share your finished product. Snap a picture and share it on our Facebook page! Have a craft idea you’d love to share? We’d love to mingle with you on Pinterest! Cute! 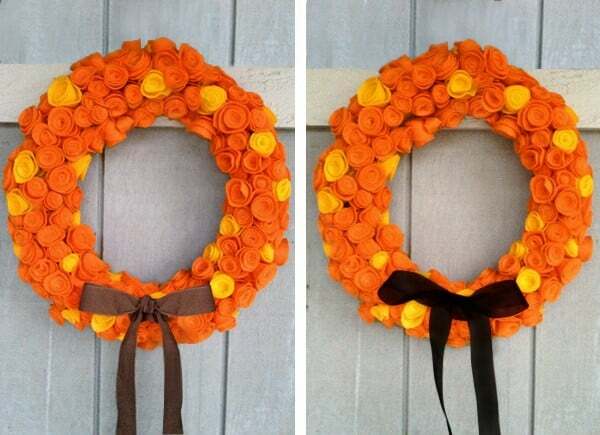 I love making wreaths, great idea. I love this wreath! I made a Christmas wreath when we first got married, but all the decorations keep falling off of it. I think this baby could be the way forward. I love the idea of doing it in red, white and green for Christmas. I LOVE your thought process! I totally think I’m going to borrow your idea. 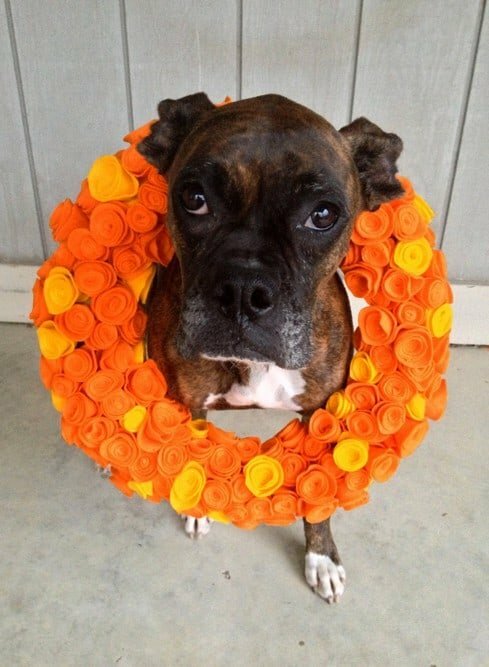 I love the wreath but the best touch was having the gorgeous Boxer modeling your creation. with the hurricane coming this wouldn’t last on my door but I know just the place to hang it inside…my pantry door. This will keep me busy while we all get cabin fever…thanks for posting. This looks great! But how long did it take to make? Thank you! It took a few hours…rolling the roses takes the longest. Great for a rainy/snowy day! Love this wreath…..but i’m not sure my boxer would sit that still! The wreath is very pretty. I admire your patience with all those flowers!! I LOVE Olive, you have to show her more often =) She looks just like my Layla when her ears are back like that. 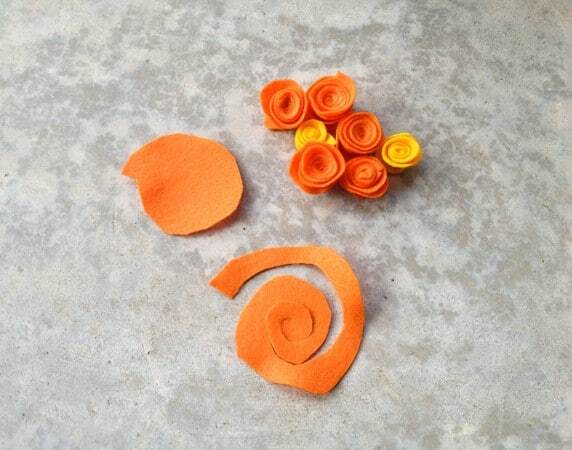 I miss working with felt! Such fabulous color choices and so versatile to work with. This is a darling wreath! So cute! Just curious where you used the fabric glue versus the super glue, though? Thanks! Thanks Pam! I used the fabric glue to hold the roses together and then the super glue to glue them to the foam ring. I’m sure any strong glue or even a glue gun would work though!